Loopmasters proudly welcome DnB producer Eveson with a brand new royalty free sample collection of Deep Liquid Drum and Bass. Artist Series 153 is a sublime collection of rolling beats, stirring basslines and melodic Synth atmospheres. 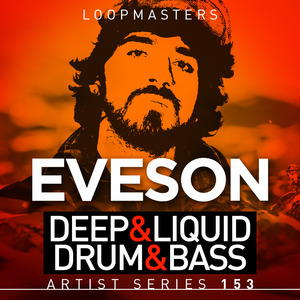 Producer, DJ and illustrator Eveson has been making his journey through the deeper spectrum of Drum & Bass since the mid 2000's. His signature ?soulful and groove driven? productions have found their way into the record boxes of elite DJs from Fabio, Goldie, LTJ Bukem, Bryan Gee, Grooverider, DJ Marky, Shy FX, dBridge, Calibre, Marcus Intalex, Doc Scott, Total Science, Loxy, Friction, Bailey, Flight and countless others and releases across a selection of the scene's finest labels, from old school legends Good Looking, 31 Records and Creative Source, to new school taste makers such as Horizons Music, Critical and Shogun Ltd.
Eveson Deep Liquid Drum and Bass is a wealth of professionally created Loops, One Hits and Sampler Patches for producers looking to craft their next Liquid Drum and Bass production. This collection features Tight Punchy Breaks, Lush Spacey Pads alongside the obligatory Grizzly Reece Basslines, Synth Chords and Piano stabs. Each component has been subtly processed for fat vintage warmth and bite without digital harshness. The One Hits give you the opportunity to put together your own magic and the killer Bass one hits are as good a place to start as any! Punchy Percussion, Synth Hits and articulate Drums supply the rest of the essential One Hit ingredients. Eveson says: I created this pack with my working method in mind, forging a wide pallet of soundscapes, pads, stabs, keys and tight, crunchy breakbeats ready to drop straight into your project, as well as crafting original melodies, ambient chords progressions and textures you can use as a foundation to kick-start your creative process into gear. Enjoy the samples. In detail expect to find 758MB of content with 360 individual WAV samples. A total of 144 Loops are included with 30 Bass Loops, 43 Music Loops, 23 Pad Loops and 18 Percussion Loops. It also contains 216 One Hits with 97 Drum sounds [14 Hats, 30 Kick, 22 Percs and 31 Snares], 38 Bass Hits, 22 Pad Hits and 59 Synth Hits. 149 Rex2 Loops are included and 144 Apple Loops, as well as 133 Software Sampler patches for NNXT, Halion, Sfz, Kontakt and Exs24. With tempos between 168 and 175BPM, this pack is aimed sharply towards Drum and Bass, and suited for Jungle, TechStep, Ambient and Liquid Funk.